Research in Web quality has addressed quality in use as the most important factor affecting a wide acceptance of software applications. It can be conceived as comprising two complementary concepts, that is, usability and user experience, which accounts for the employment of more user-centred evaluations. 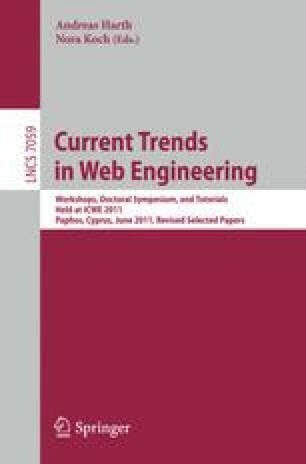 Nevertheless, in the context of Web 2.0 applications, this topic has still not attracted sufficient attention from the HCI community. This paper addresses the quality in use of Web 2.0 applications on the case of mind mapping services. The evaluation methodology brings together three complementary methods. The estimated quality in use is measured by means of the logging actual use method, while the perceived quality in use is evaluated by means of the retrospective thinking aloud (RTA) method and a questionnaire. The contribution of our work is twofold. Firstly, we provide empirical evidence that the proposed methodology in conjunction with the model, set of attributes, and measuring instruments is appropriate for evaluating quality in use of Web 2.0 applications. Secondly, the analysis of qualitative data reveals that performance and effort based attributes considerably contribute to mind mapping services success.